Three railway stations between Dharmanagar and Garji (183 km) in Tripura have turned into jungles because of lack of maintenance over the years. Every day, hundreds of passengers board trains from these three stations but despite that there is no maintenance work done for the station. Although there is proper infrastructure, lack of maintenance has turned it into an abandoned place. 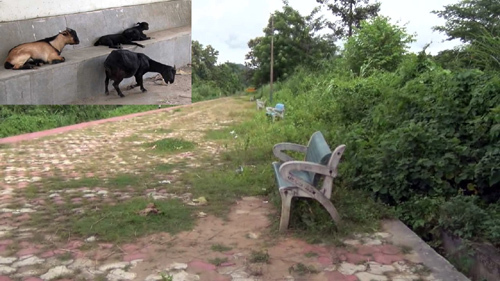 Ticket counter, waiting room, rest shed have turned into grazing ground for cattle. Passengers every day board trains from these three stations but without tickets. When asked, passengers stated that as there is no ticket counter so they are unable to get tickets and hence there is no revenue. It is to be mentioned here that overall there is lack of sufficient railway staff members in the stations in the State. As per sources, there is also lack of sufficient staff for patrolling duty, mechanical and electrical sections, track men, TTEs, potter men and others. Currently, four local trains and six express trains run in the State and the people of the State demand for more number of trains. Train on the BG railway track was introduced in 2009 in Tripura and since then few stations are still running without ticket counters.